(AFP) - With Sudan in turmoil following the ouster of their ally Omar al-Bashir, Gulf powerhouses Saudi Arabia and the UAE are following events closely as they seek to protect their interests, analysts say. And after weeks of silence on Sudan's political turmoil, Saudi Arabia and the UAE on Sunday released a lukewarm reaction to Bashir's toppling, calling for "stability" and a "peaceful transition". Tens of thousands have protested outside Sudan's army headquarters since April 6, initially to urge the military to back their demand that Bashir be removed. 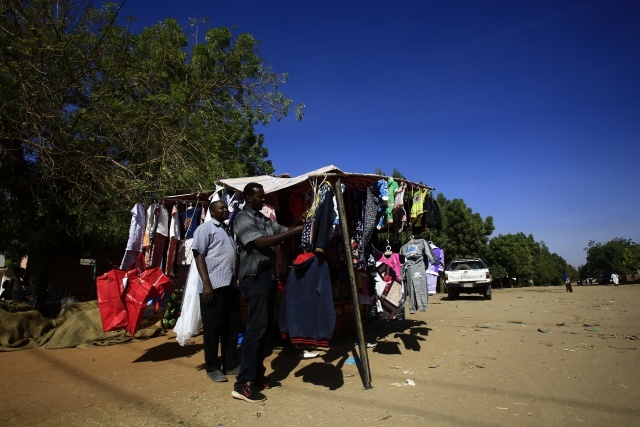 Thousands have remained encamped there to keep up the pressure on a military council that took power after ending Bashir's three-decade rule on Thursday. Saudi Arabia and the UAE have both voiced backing for the transitional council, with Riyadh promising an aid package to the people of Sudan "in order to alleviate suffering", according to a statement published by state news agency SPA. "The Gulf states are watching Sudan with apprehension and will do everything possible to ensure that the transition happens in continuity, meaning that Sudan remains under military control," Bitar told AFP. Bashir, who ruled Sudan with an iron fist for nearly 30 years, broke ranks with Saudi Arabia's regional arch-nemesis Iran after Riyadh's intervention in the Yemen war, sending much-needed troops to battle rebels linked to Tehran alongside the Saudi-led coalition. General Abdel Fattah al-Burhan has risen as the head of the transitional council -- a move analysts say is not unwelcome in some Gulf states. "All sides in the Gulf want to maintain some sort of stability," said Andreas Krieg, a professor at King's College London. "Burhan has no ties to the Islamist deep state and has been one of the main liaisons of Sudan to the UAE during the Yemen war. "Burhan appears to be more prone to accept the UAE's policy of zero tolerance towards political Islam than others." "The Gulf states don't want a violent transfer of power. They don't want another tragedy like Libya, Syria or Iraq," said Mustafa Alani of the Geneva-based Gulf Research Center. "The only way is a peaceful transfer of power," he added. "In Sudan and Algeria, change is inevitable. The military institutions will supervise the change and hand over power to the civilians." Gas-rich Qatar had wielded some influence over Bashir's regime before Khartoum joined ranks with Riyadh in the Yemen war. With Bashir gone, it remains to be seen whether Sudan will continue to fight in Yemen -- and whether Doha will support the new government. "Qatar has its own reasons to object because it had some sort of influence on the previous regime," Alani said. "Qatar has an objective of supporting Islamists in power because they have some sort of influence over this sort of regime." And while Qatar has "a tendency to support opposition movements," the country's historic proximity to the Bashir regime leaves it in an uncomfortable position in the interim, according to Bitar. But across the board, Bashir's ouster is a pivotal moment for the Gulf. "One shared goal across Gulf states is maintaining Sudan's stability -- preserving the institutions of the state while reform and transition takes place," said Elizabeth Dickinson of the International Crisis Group. "We are not in the Gulf of 2011, completely allergic to transition," Dickinson told AFP. "Leaders here understand that autocratic governments that do not perform cannot survive. The question is how they should fail. "With so much fragility across the greater region, there is a sense here that a managed transition could be the best way forward."